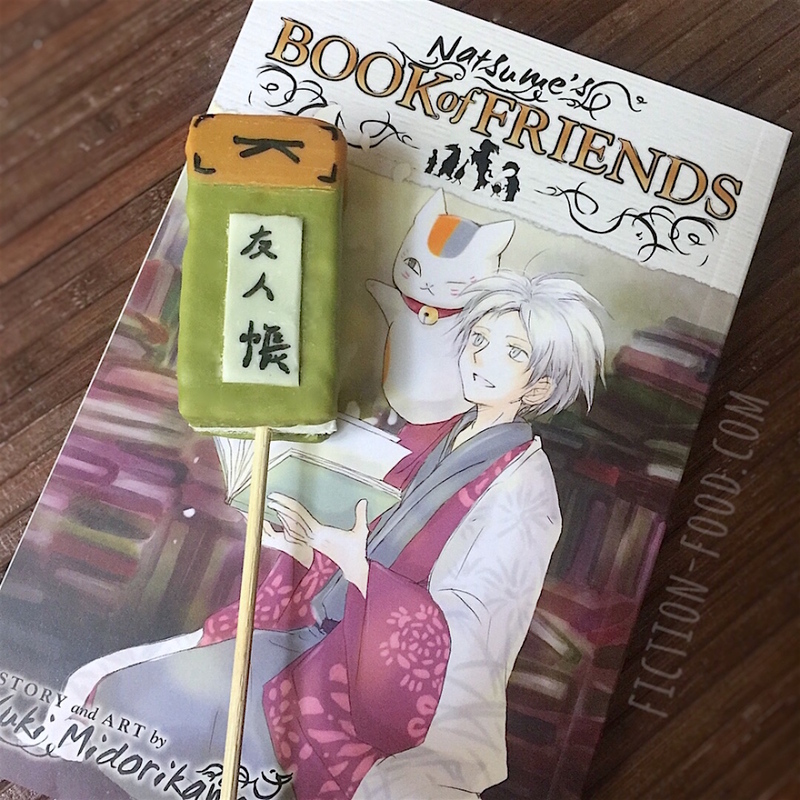 Natsume's Book of Friends, or Natsume Yuujinchou in Japan, is a beautiful, long-running manga series by Yuki Midorikawa that has also been adapted into several seasons of anime. I think of it as having a "slice-of-life" genre feel combined with the fantasy of youkai, or Japanese spirits and demons. The story follows a teenager named Natsume and how he balances and navigates his interactions with youkai, who he has the special sight to see, and his regular life with adopted family and school friends. I love this manga and anime so much; it's my favorite! 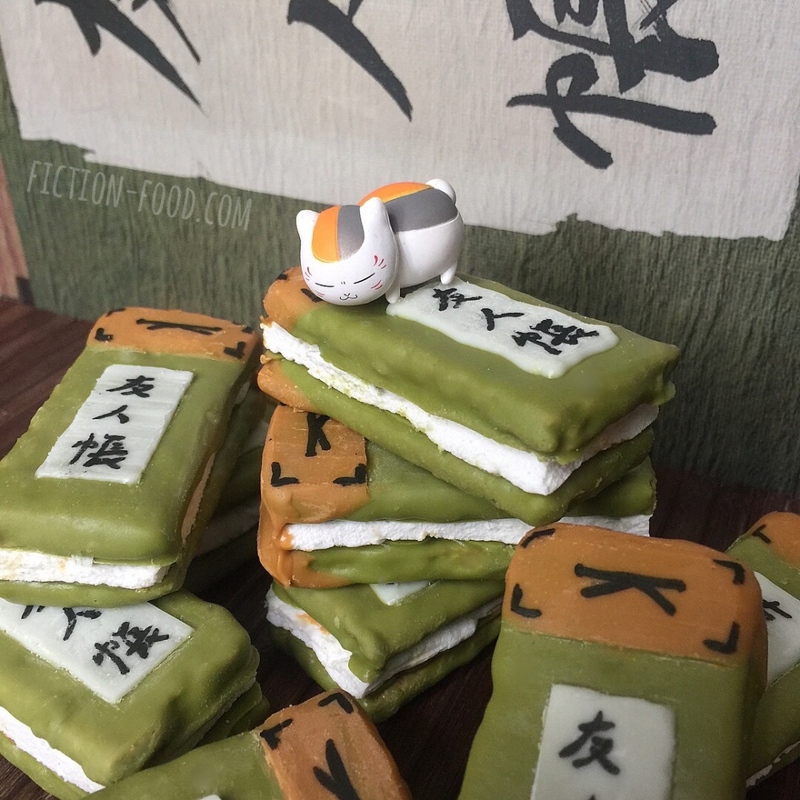 This food idea has been a long time coming; I partially made these a few years ago but didn't finish them and time passed. 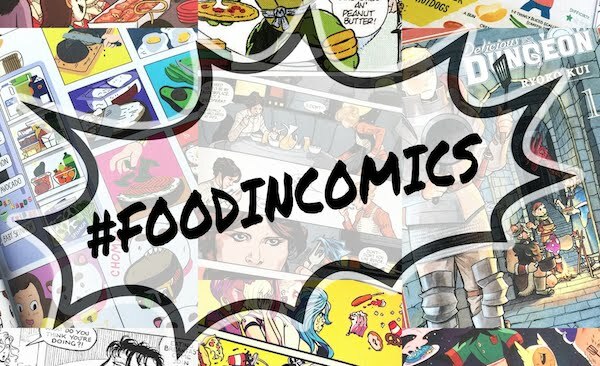 Now, for #foodincomics month, I was motivated to follow through and share them with you! 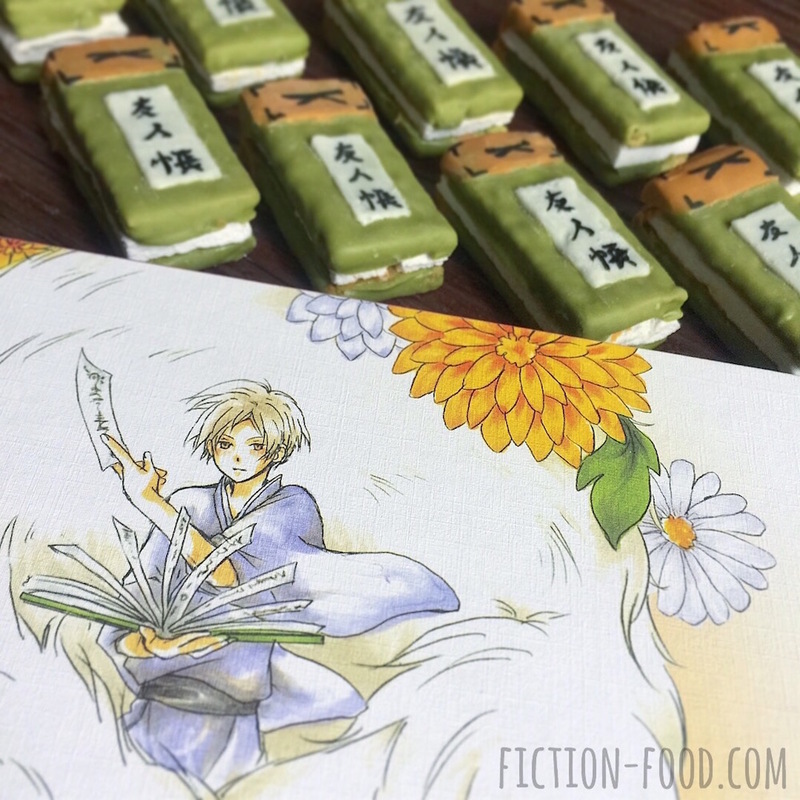 Note: I chose to make matcha chocolate to achieve the green color for the book because it's so very Japanese, but in a pinch you could use green candy melts, or even if you happened to have spirulina powder as opposed to matcha powder... The book appears different shades of green in different iterations, so as long as what you use is some type of green (excluding neon!) you're good to go. For the white "pages" in the books in the recipe below, cut homemade marshmallow is used to get that exact rectangle shape, but to save time and effort you could simply spread on some white frosting from a can. ;) If you're going to use frosting but also want them to be cookie pops you'll need to secure the sticks with melted chocolate onto one of the crackers, and then spread the frosting on and sandwich it all together. Marshmallow: Line a large tray with plastic wrap & spray generously with non-stick spray. Put the gelatin into a small bowl & add 1 Tbsp. cold water. Let sit so the gelatin can "bloom" or absorb the water & solidify. In a small pot on medium heat combine the sugar & 1 Tbsp. water. Heat until the sugar dissolves, swirling the mixture every-so-often instead of stirring with a spoon. Remove from heat & plop in the solidified gelatin. Return to heat & bring to a boil until the gelatin dissolves. Pour the mixture into a mixing bowl & add a small pinch of salt. Beat on high speed until white & fluffy & doubled in volume, about 5 minutes. 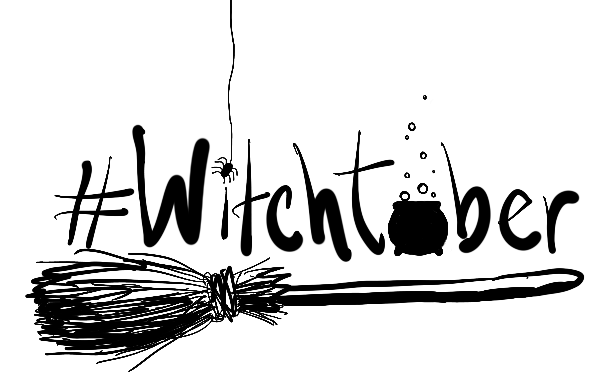 Pour the marshmallow mixture onto the sprayed plastic wrap & spread it out evenly to about 1/4" or less thickness. Spray another large sheet of plastic wrap with non-stick spray & lay it over the marshmallow (you can also flatten it out more after putting the top layer of plastic on). Let sit on the counter for about 4 hours or overnight to solidify. Sandwich Cookies: Line a large tray with parchment or waxed paper. Melt the 1 cup of white chocolate chips by placing it in a large glass bowl set over a small-medium pot of lightly steaming water (a few inches of water that does not reach the glass bowl, over medium heat). Stir the chocolate until smooth (don't let any water droplets into the bowl). Once completely melted, remove from heat & sift in the matcha powder 1 tsp. at a time, stirring to combine. 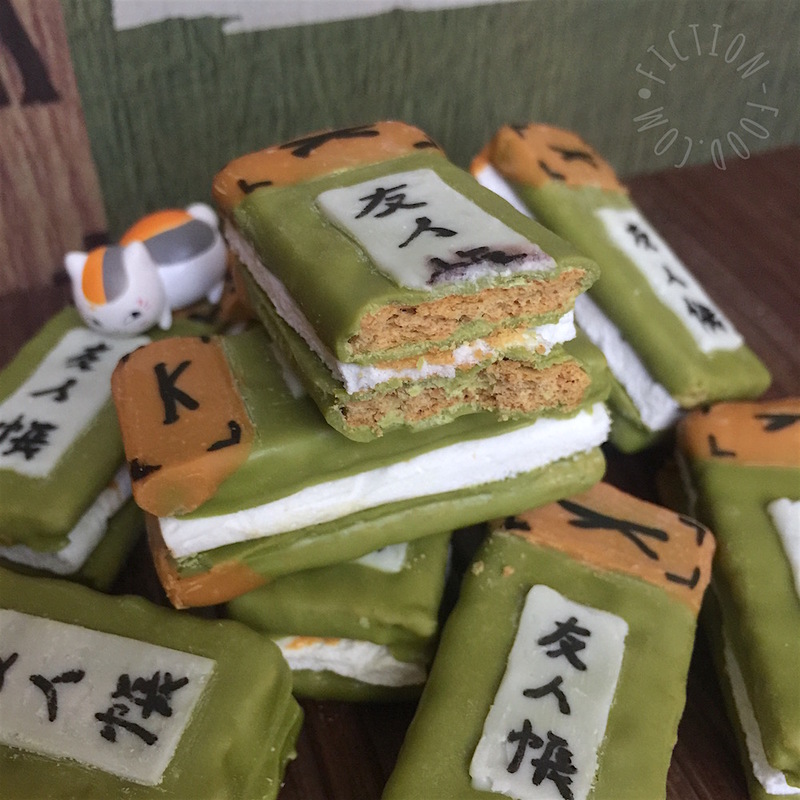 Using a fork, coat each graham cracker quarter in the matcha chocolate & then lay it on the parchment to harden. Once the matcha chocolate has hardened, melt the peanut butter (or butterscotch) chips. Place the chips in a small microwave-safe bowl (because it's such a small amount!) & zap in the microwave at half power for 30 seconds & stir. Zap for another 10 seconds & stir again. Repeat until the chips are fully melted & smooth (if the mixture is still thick, stir in a tiny amount of canola or coconut oil to help thin it out). 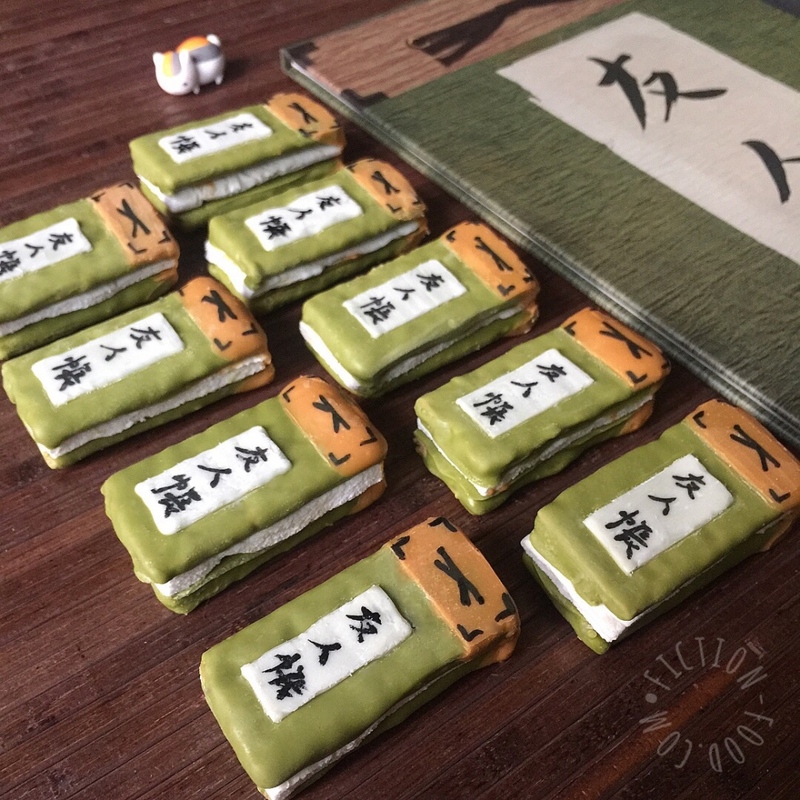 Dip one end of each matcha cracker into the peanut butter melt, up to about 1/4". Try to make it a straight line across. Set them back on the parchment to harden. Using a graham cracker quarter as a template & a pizza cutter to cut, cut 10 rectangles from the flat marshmallow. Using a little melted chocolate to stick them together, put a rectangle of marshmallow between 2 coated crackers. Repeat to all crackers & marshmallow pieces. If you'd like to make these into cookie pops, use small size bamboo skewers (these are shorter & thinner than regular grill kabob skewers) & gently push/twist them up through the marshmallow, while holding the cookies in place. Next, place the 1 Tbsp. of white chocolate chips into a sandwich baggie & melt in the microwave similar to the way you melted the peanut butter chips, except instead of stirring, simply squish them in the baggie until melted. Snip off a teeny-tiny hole from one corner of the baggie & carefully pipe a filled-in rectangle on top of each sandwich cookie (as seen in the photos). Let harden. At this point, with all of the chocolate hardened, carefully use a small sharp knife to scrape, flatten, & make smooth any places on the cookies that need it (this is optional, for detailing). 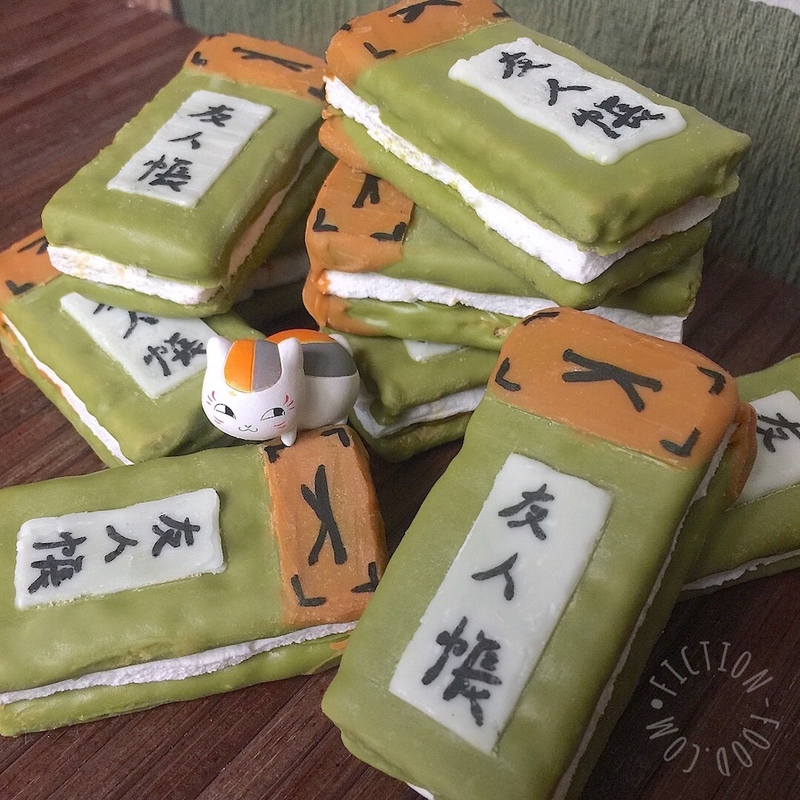 Doing this to the little white chocolate rectangle on the tops of the cookies helps greatly with the next step of writing on the kanji. 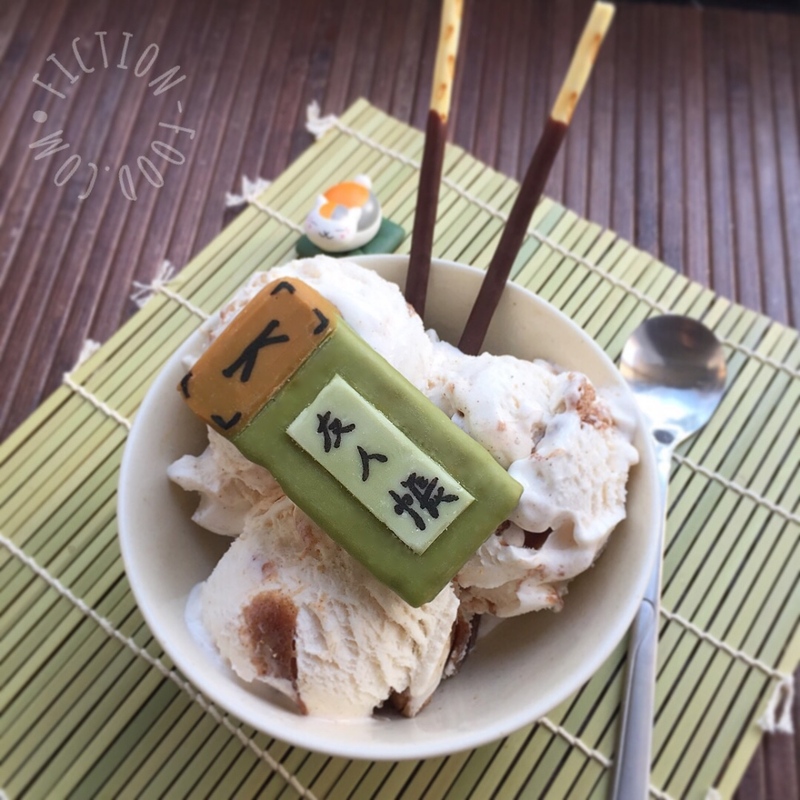 Use a black food marker to draw the details on the tan part (see photos for reference) & the kanji on the white part; it's written in a stylized calligraphy so it's slightly different looking than the common/basic way of writing "yuujin-chou" [友人帳].